Pictured left to right, Sunbury Village councilmen Martin Fisher and Tim Gose; volunteers Joe Gochenour and Aaron Noblet; and councilman Joe St. John. Gochenour and Noblet were recognized for their landscape contributions to Sunbury. In an age where mainstream media uncovers outrageous scandals by individuals and institutions seemingly over every news cycle, exemplary behavior by Sunbury and Big Walnut-area residents has been recognized at recent meetings of the Sunbury Village Council. The volunteer efforts of former councilman Gochenour and arborist Noblet included the planting of three Cypress trees along Prairie Creek in Evening Park last April for Arbor Day. And as a 2.5-hour meeting was winding down on April 3, councilman Dave Martin took the time to recognize an act of kindness and lifesaving on the part of Big Walnut students. “The Big Walnut varsity baseball team, while on spring break in Myrtle Beach this past week, helped a man in distress while on the beach. According to multiple witnesses, a group of Big Walnut baseball players ran to the beach to rescue an elderly man who was an above the knee amputee that had lost his crutches in the surf and was floundering around in the water struggling to stay up much less get up out of the water. The group of boys included a 7th-grader (Kasen Knapp), sophomores (Mahlon Spangler, Jake Bales, Brady Hershberger, Jake DeVol) and senior (CJ Rockwell). They immediately acted without hesitation to rescue the man in distress. After they assisted lifting and getting the man out of the surf, the Big Walnut baseball coaches assembled all the boys to form a line and comb the surf looking for the one crutch that had been swept away. Unfortunately, the crutch was not found but it wasn’t from a lack of effort. In other local government matters, there was a Planning and Zoning meeting on April 1 with two rezoning hearings, two building improvement applications, and a discussion on barb wire fences in Sunbury. https://www.delgazette.com/wp-content/uploads/sites/40/2019/04/web1_SUNBURY-TREE.jpgPictured left to right, Sunbury Village councilmen Martin Fisher and Tim Gose; volunteers Joe Gochenour and Aaron Noblet; and councilman Joe St. John. 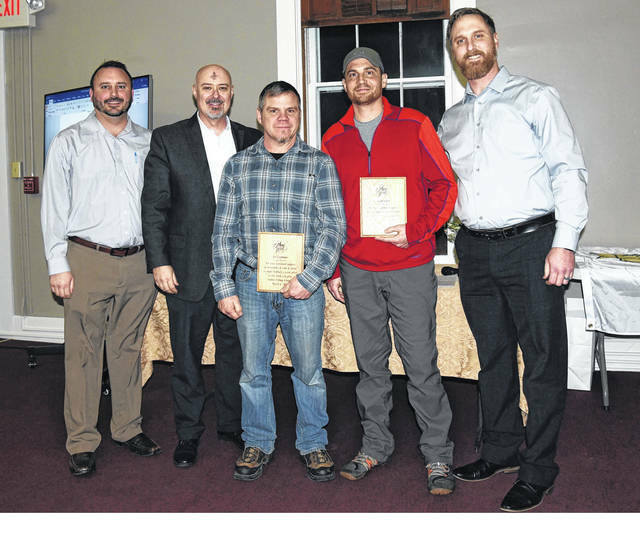 Gochenour and Noblet were recognized for their landscape contributions to Sunbury.